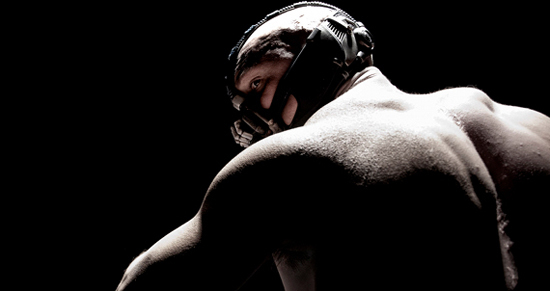 Listen To Tom Hardy Perform As 'Bane' As He Warns Gotham "Take Control" In 'THE DARK KNIGHT RISES'! Tom Hardy recently shot a scene at Heinz Football field in Pittshburgh in front of thousands of locas as extras for The Dark Knight Rises & somebody managed to record some footage of the scene including Hardy's very interesting performance of Batman's enemy Bane. Its the first time we get to hear his voice as he bellows: "Take control of your city! This, this is the instrument of your liberation..." Hit the jump to hear it. Scene Description: "The Gotham Rogues played the Rapid City Monuments. During the opening kick off, Bane sets off a bomb that blows up a large chunk of the football field and kills the players. The mercs storm the stadium along with Bane & he has some sort of bomb. He makes a speech about "take control of your city....behold the object of your liberation" It all looked really good & it was all filmed with IMAX cameras. someone already put up about the Tumblers, that's false info. They aren't included in the shot at all, only made an appearance to show them off, [the supposed Bomb] its not an earthquake machine. Bane spoke into a mic he took off a dead referee. He literally sounds like an old man on a respirator. It was hard to make out what he said. Something along the lines of "your city is being liberated..." he had a big object about 5 feet tall, it was a sphere, probably a bomb. Think about the one in the batman movie with two-face at the circus. The explosions werent much so im not too mad about it. Its all gonna be digital effects. It's sooo hot. They are having a raffle now. I think the next scene is Bane, they said he comes out and threatens the crowd. I saw a friend of mine who was a merc, he said Tom Hardy is super cool to talk to and real down the earth. He said the costumes are awesome. I'll try to snap pictures of him in action. The explosions just happened, couldn't get a picture because our section had to run away from it. They just said that the "field will be totally destroyed" and the only part left is the one picture I sent you with the field elevated. They also just said the 3 Tumblers will be brought out again because "Bane stole them" I don't know how true that is, but they announced it so let's see how that rolls." The Dark Knight Rises hits theaters July 20th, 2012 and is directed by Christopher Nolan starring Christan Bale as Batman, Tom Hardy as Bane, Anne Hathaway as Selina Kyle/Catwoman, Gary Oldman as Commissioner Gordon, Morgan Freeman as Lucius Fox, Michael Cain as Alfred, Juno Temple & Josh Pence as a young Ra's al Ghul. Props to CBM for the video. I'm reading: Listen To Tom Hardy Perform As 'Bane' As He Warns Gotham "Take Control" In 'THE DARK KNIGHT RISES'!Tweet this!